JUKI DDL8500 & DDL8700 Lockstitch Machine - Replacement Parts High Speed, High Quality Flatbed Lockstitch Machine manufactured by the JUKI Corporation. This is the machine the Chinese manufacturers like GEMSY, FEIYUE & YAMATA tend to copy. 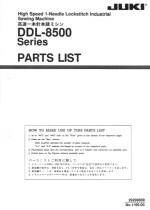 Need Parts for your JUKI DDL8500 Sewing Machine?